CD980S 50000KG CAPACITY CABLE DRUM TRAILER. In December 2009, Balfour Beatty Utility Solutions approached us for a cable drum trailer to cope with a drum, which weighed 50,000Kg. The project was an underground tunnel from Croydon in London to Beddington in London and the overhead power cables were being taken down and replaced by 400Kv cable, which was running through the tunnel to severely reduce the cost of future maintenance and upkeep. 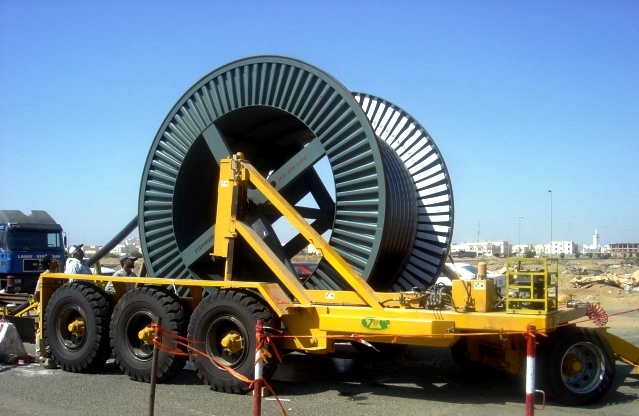 This requirement was in 40 years of manufacturing the largest project we had ever been asked to take on, the drum was 4500mm in diameter and 3700mm in width, which made the overall width of the trailer 5200mm. The trailer was delivered in the middle of 2010 and the project was completed in early 2011, the trailer operated successfully and the client was very happy with its performance. What this project proves is that wherever possible SEB International will always try to assist its customers no matter how large or small there requirements maybe.